We’ve all been there. Either we are the one receiving the bad news, or the one giving the bad news. At work, it’s usually the result of a project going off the rails. A supplier has failed to deliver on time. A design that was supposed to work has proven faulty. An assumption that was made during the planning process has proven wrong. Or, a large mistake has been made. Stress happens at work. Stress is caused when our perceived ability to respond to a situation does not match the challenge we face. We aren’t stressed over easy work. We aren’t stressed over tasks we are confident we can achieve. We are stressed when our workload is so large that we don’t believe we have the time and ability to accomplish everything. We are stressed when the cost of failure is high, and our perceived ability to achieve success is low. We are stressed when we believe we are facing an unwinnable situation. And that’s the challenge and opportunity as a manager in a stressful situation: do you believe there is a way to find or create success in spite of the obstacles? Imagine, presenting a prototype of your final project to your senior management, knowing it’s not great and having a fraction of the time you really need to fix the final design. It’s happened many times before. Just recently, Apple chose to delay the release of their AirPod wireless headphones. I can only imagine what it was like for the project manager who had to present to Tim Cook. It probably went something like this: “I know we said that they would do X, Y and Z, but given the budget and time constraints we are currently able to make them perform only with this level of battery life, and this sound quality. They are occasionally glitchy, but the user can just re-sync the headphones and it will be okay.” The project manager, fearing for their job and the job of their employees would have likely tried sell what they were able to do, while trying to avoid admitting they didn’t achieve what they set out to do. It took a brave leader to say: “these aren’t ready, and we will delay the launch to give you time to fix it. I trust you and your team will fix it.” It took a brave manager to take up that challenge. That moment we are willing to admit failure is interesting to me, but what I find more fascinating is the difference between the people who can take that experience and rise above next time, compared to those who just give up. One is able to take the stress and lead their team to future success, and the other will end up out of a job (or will just jump to another company and a “safer” job). The ones who make a large impact on their company and the company culture are those who are able to find opportunity for success in a stressful situation. They are the ones who will become future leaders in the organization. So how do they think different(ly)? As a manager, you achieve success by enabling your team to be focused, productive, and creative. Your team needs to know what success looks like for their tasks. They need an environment that supports them in performing the work exclusively. And, they need to know how much flexibility and autonomy they have towards achieve the goal. It may seem like I’m stating the obvious, but it’s very common that what management understand as success is different in some way than what the employee understands success to be. There are many case studies about this, and one of my favourites is from Harvard Business Review, where a VP of sales had a different idea of success (increasing margins) than the CEO (increasing cash flow and increasing margins), and this difference lead to both failing and being fired. They never took the time to make sure they both had the same definition of success. Employees feel stress for the same reasons you do: they are doing work that they care about, and are afraid they can’t meet the targets. At a deeper level, they are worried about the long term consequences are of potential failure. 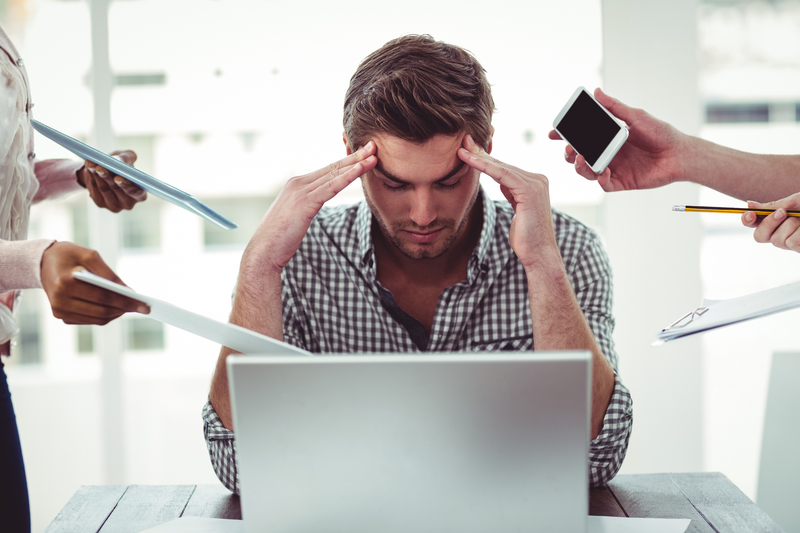 When we are stressed, our attention often becomes fixated on the perceived threat–an adaptive behavior when we were running from things that were physically threatening, but is certainly maladaptive in the office. Because, when we are focused on the problem, its harder to find a solution. During times of stress, our focus narrows. This works in your favor when success is clearly understood, and the path to achieve success is clearly understood. Think about when you are playing basketball: your attention ignores things that aren’t relevant and you are acting in-the-moment to either get open, or find/create an opening to move the ball towards (or in) the net. As a manager, using stress during difficult times is an effective motivator and will help both you and your employee get more work done. But, the problems happen when the goals aren’t clearly understood, and the path to success is not clearly understood. That’s when people go from feeling driven and experiencing flow, to a state of anxiety and potentially panic. Its the difference between knowing the plays and how to run them, and feeling like you don’t have what it takes to shoot the ball. In the office, it’s the difference between knowing how each individual can use their strengths to achieve the desired outcome, and feeling like your team doesn’t have what it takes to complete the project. A successful manager is one who is able to take a moment of failure and turn it into rocket fuel for their team. They do this by the way they focus their team. The manager needs to regularly calibrate their people to ensure they have a clear understanding of what the right goal is. And, they also need to regularly redirect their people to ensure they have a plan that they are confident they can follow. If you are a good manager, your people will care about you, the company and the customers. They will want to do their best in order to try to achieve success. The best managers are the ones who help each employee clearly understand how they uniquely can do their best, and how to apply that to the project at hand. They may miss some deadlines but they will find a plan to bring the program back on track by making the most of their most important resource, their team.